The awards are typically something of an afterthought at the Grammys. Boatloads of trophies are given out before the ceremony even begins airing, and, this year, winning musicians' speeches were cut off to move along an already lengthy broadcast. 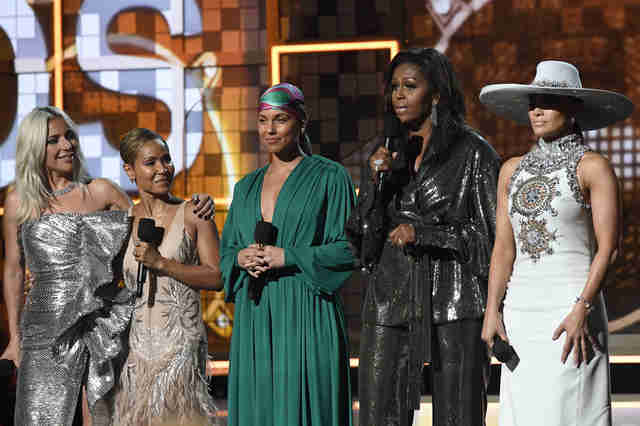 But barring some notable exceptions, the Recording Academy actually put on an entertaining show, largely thanks to the women on stage. During the telecast, we got tributes to icons like Dolly Parton and Diana Ross, and performances from Janelle Monáe and St. Vincent. (The less spoken about the Post Malone/Red Hot Chili Peppers team-up, the better.) Best New Artist winner Dua Lipa even used her speech to not-so-subtly dig Recording Academy president Neil Portnow, who said last year that female artists need to "step up" in order to have a larger presence at the Grammys. "I guess this year we really stepped up," said the British singer. As for the biggest trophies, country artist Kacey Musgraves' Golden Hour -- our favorite album of 2018 -- ended the night by being crowned Album of the Year. Meanwhile, other categories led to landmark moments: Childish Gambino's "This Is America" became the first-ever rap track to win both the Song of the Year and Record of the Year categories, while Cardi B is now the only solo woman to win Best Rap Album, for Invasion of Privacy. But what else went down? Here are some of the best, wildest, and weirdest moments that happened at the 61st Annual Grammy Awards. Esther Zuckerman is a senior entertainment writer at Thrillist.